There are nine senior Go-Karting classes in the UK all of which are recognised by the Motor Sports Association (MSA). You move into the senior category as soon as you turn sixteen. 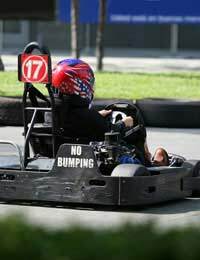 As with the junior classes, there are minimum weight restrictions for Go-Kart and driver in all classes. Formula 100 National: Anyone aged sixteen and over can take part in this class. There is a minimum weight restriction of 155 kg, which both the driver and the Go-Kart into consideration. The Go-Karts use a rotary-valve engine that dates back to 2003 (or earlier). Formula TKM - 2S: This class is open to anyone who is at least sixteen years old. The combined weight of the Go-Kart and driver must be at least 148 kg (or at least 163 kg for the heavy class). The Go-Karts use TKM BT82 115 cc piston-port engine. Use of the clutch is optional. Rotax Max 125: This class is for anyone aged over sixteen. The minimum weight of the Go-Kart and driver must be at least 162 kg. The Go-Karts use a Rotax FR 125 Max engine. It is a two-stroke engine that is sealed. Use of the clutch is mandatory. Formula Blue: The class is open to anyone over sixteen. The combined weight of the Go-Kart and driver can be anything between 125 kg and 155 kg. The Go-Karts use NKRA listed engines. Formula Libre: You can take part in this class as long as you are over sixteen. The Go-Kart and driver must weight 155 kg. The Go-Karts use 100 cc direct drive engines. There is an open grid for club racing. Intercontinental A (ICA): This class is for those who are over sixteen. The Go-Kart and driver must weight at least 150 kg. The Go-Karts use a reed valve two-stroke engine that is at least 100 cc. Formula A: This class is for those who are at least sixteen. The driver and Go-Kart must have a combined weight of at least 150 kg. The Go-Karts use rotary or reed valve engines, which are usually the latest models in both cases. Formula TKM - 4S: This class is also for those over the age of sixteen. The Go-Kart and driver must combine to weigh at least 162 kg (or at least 175 kg for the heavy class). The Go-Karts use TKM 200 cc four-stroke engines. Use of the clutch is mandatory. Honda Senior: This class is for those over the age of sixteen. The Go-Kart and driver combination must weigh at least 175 kg. The Go-Karts use two Honda Gx 160 cc four-stroke engines. Use of the clutch is mandatory. In many cases, it will be the combined weight of the Go-Kart and driver that determine which senior Go-Karting class you can take part in, as this combined weight is one of the entry requirements in both junior and senior classes. As long as you meet the weight requirements, you are free to enter any of the classes. However, it will be much easier if you have previously come through the junior classes, as this will have taught you how to handle Go-Karts in general (albeit less powerful ones).